Mr. Lee joined Stone Pigman in 1974, is a member of the firm and chairs the firm's Commercial Litigation Practice Group. For the last 15 years, his practice has included a concentration in insurance and insurance class action lawsuits. Mr. Lee has experience in handling coverage issues, bad faith claims, mold claims, regulatory issues and class action claims with a myriad of substantial issues. Defended a Hollywood actor/director/producer in a federal jury trial involving $18 million claims of securities law violations and fraud brought by investors, including actor Stephen Baldwin, in an oil-spill-remediation technology corporation. Representing small Louisiana insurance company in class action challenging its handling of first party total loss motor vehicle claims. Defended major insurance company in a class action lawsuit that alleged that third-party claimants are automatically entitled to recover for diminished value of damaged automobiles. After an evidentiary hearing, the trial court certified both a plaintiff and a defendant class. Successfully obtained a reversal of that judgment on appeal. Defended insurance company against class action lawsuits that alleged improper handling of claims arising out of a large hail storm in a three-parish area. After securing a consolidation of the cases filed in Orleans Parish Court, he successfully defeated the plaintiffs' motion for class certification after an evidentiary bench trial. Defended insurance companies in an array of claims alleging bad faith claims handling of property damage and/or personal injury claims. Defended the Housing Authority of New Orleans ("HANO") in class action lawsuit filed by certain residents of the Desire Housing Development alleging failure to comply with federal guidelines. Defended HANO in class action filed by certain residents of housing developments who allegedly suffered damage from mold. Defended insurance company in the Federal District Court for the Eastern District of Louisiana in two class action lawsuits in which the plaintiffs alleged that the insurance company's use of credit reports in analyzing certain insurance claims violated the Fair Credit Reporting Act. Mr. Lee is a Past President of the Louisiana State Bar Association. Throughout his career, he has held numerous other positions within the LSBA, including membership in the House of Delegates, 1997-2003 and in the Board of Governors, 1993-96; Chair of the Practice Assistance and Improvement Committee, 1997-99; Chair of the Continuing Legal Education Program Committee, 1991-93; and ad hoc member, Mandatory Continuing Legal Education Committee, Vice-Chair (2005-07), Chair (2007) and Co-Chair of the Standing Committee on Diversity (2008-2011). He has received three LSBA President's Awards, first in 1993 for his work as Chair of the Continuing Legal Education Program Committee, in 1998 for work as Co-Chair of the Practice Assistance and Improvement Committee and in 2010 for work as Co-Chair of the Standing Committee on Diversity. He has served as a member of the American Bar Association House of Delegates (2003-05), is a former member of the American Bar Association Commission on Racial and Ethnic Diversity in the Profession and a member of the American Bar Association Standing Committee on the Federal Judiciary (2011-14). Mr. Lee is a frequent speaker at legal seminars. In addition to his involvement with the bar associations, Mr. Lee was appointed to the Board of Administrators of the Tulane Educational Fund (2004-16) (Emeritus 2016-present). Mr. Lee was a member of the Louisiana Indigent Defense Assistance Board, served as Chair of the Federal District Court for the Eastern District of Louisiana Civil Justice Reform Act Advisory Group and served as vice chair and later co-chair of Lawyer Disciplinary Committee for the U.S. District Court for the Eastern District of Louisiana (2011-17). He was appointed to the Louisiana Board of Regents for Higher Education, 1989-94. He is a Past Chairman of the Board of the Audubon Nature Institute, a member of the Board of Directors for Attorneys' Liability Assurance Society, Ltd., a member of the Tulane University Inn of Court and a member of the Advisory Board of Editors of the Tulane Law Review. He is also a member of the Louis A. Martinet Society. Mr. Lee is a member of the American, National, Louisiana, New Orleans and Fifth Federal Circuit Bar Associations. Mr. Lee is a Fellow in the American College of Trial Lawyers. Mr. Lee has received three LSBA President's Awards, first in 1993 for his work as Chair of the Continuing Legal Education Program Committee, in 1998 for work as Co-Chair of the Practice Assistance and Improvement Committee and in 2010 for work as Co-Chair of the Standing Committee on Diversity. 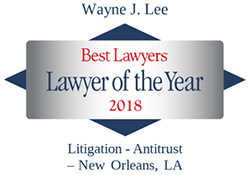 He has been named to The Best Lawyers in America in the fields of bet-the-company litigation, commercial litigation, insurance law, antitrust litigation and personal injury litigation-defendants, and to Chambers U.S.A. America's Leading Lawyers for Business in the field of general commercial litigation and to Louisiana Super Lawyers. In 2006, the Louisiana Bar Foundation's Board of Directors selected Mr. Lee as the 2006 Distinguished Attorney in Louisiana. He was inducted into the Tulane Law School Hall of Fame in 2013 as a member of the inaugural class. In 2018, he was inducted as a member of the National Bar Association Hall of Fame.